Songwriters: If you’re pitching your songs to publishers, recording artists or submitting to song contests, you could be missing out on opportunities because your demo is not giving your song the best chance of success. I’ve been a judge for several song contests, including the Australian Songwriters Association for the past several years. One of the things often letting the song demos down is the guitar playing and guitar sound. It often takes away from the actual song rather than adding to it. Here is an example of some songs I’ve played on. This has led me to offer this service for songwriters who want better sounding recordings of their songs. Send me your song and I will add professional sounding guitars to them. It WILL make a difference to your song. Send me your song files (with notes for direction of guitar parts if you have some ideas, or leave it to me to come up with ideas) and I’ll send you back the guitars professionally recorded for you to use in your song. Styles inclued: pop, rock, jazz, country. Guitars: Electric, acoustic, 12 string & bass guitar. Contact me for details and pricing. 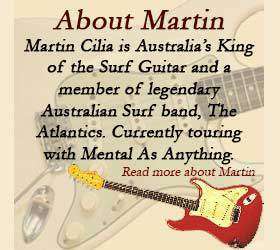 Email info@martincilia.com. Was wondering regards your availability for free lance studio guitar over the next few years, as you have been busy with the Mentals. In case I decide to do a surf inspired project, have spoken to Jeff when he was at A sharpe several times. Thank you.